Legendary basketball star William Felton (Bill) Russell was a five-time National Basketball Association (NBA) Most Valuable Player and twelve-time All-Star. He was also the centerpiece of the Boston (Massachusetts) Celtics basketball dynasty when his team won eleven NBA championships during his thirteen seasons with the team. Russell is one of only seven basketball players to win an NCAA Championship, an NBA Championship, and an Olympic Gold Medal. William Russell was born on February 12, 1934, in Monroe, Louisiana. His family moved to the San Francisco (California) Bay Area where he attended McClymonds High School in Oakland. Russell was a center on his high school basketball team. Towering in height at 6’10”, he earned a scholarship to attend the University of San Francisco (USF) in 1954. There he developed into a defensive powerhouse and led his team to two National Collegiate Athletic Association (NCAA) championships in 1955 and 1956. Russell averaged 20.7 points and 20.3 rebounds in his three-year varsity career. He was also on the U.S. Olympic Team for which he and teammates won gold medals in 1956 in Melbourne, Australia. In 1956 the Boston Celtics of the National Basketball Association (NBA) drafted Russell for his defensive abilities in rebounding and shot blocks. In an era when scoring points was a major focus for many teams, Russell honed his abilities on defense and changed team strategies. He helped the Celtics win nine championships in his first ten seasons and during that period continually led the league in rebounding. Russell won MVP awards in 1958, 1961, 1962, 1963, and 1965. He also changed the way basketball was played, with opposing centers emulating his techniques. Following another NBA Championship in 1965–66, Red Auerbach retired as head coach of the Boston Celtics, and Russell took over as player-coach the following season, becoming the first African American coach in the league and the first player-coach in recent NBA history. As both a player and a coach, Russell led Boston to a 60-21 regular-season record, but the Celtics finally lost to an explosive Philadelphia (Pennsylvania) 76ers team in the Eastern Division Finals. When the Celtics failed to win the title that year, Russell’s coaching job was considered in jeopardy, and many in the league questioned whether the player-coach model was viable. Russell remained with the team, and, in the 1967–68 season, the Celtics regained their dominance in the league with another NBA championship under his guidance. From that point, his coaching abilities were no longer questioned. In Russell’s third year as player-coach, Boston repeated as NBA champion by defeating the Los Angeles Lakers. After that season, Russell retired, having led the team to eleven championships in thirteen years. 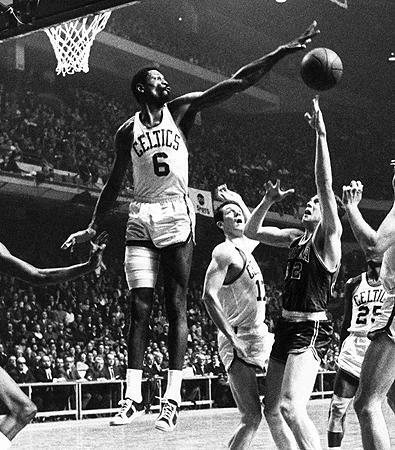 Bill Russell had a career average of 15.1 points and 22.5 rebounds per game and had amassed 21,620 career rebounds, second in NBA history only to Wilt Chamberlain’s 23,924. After retirement, Russell coached the Seattle (Washington) Supersonics from 1973 to 1977 and the Sacramento Kings from 1987 to 1988. His success as a coach was modest, although in 1976 he did lead the Supersonics into the playoffs for the first time in their history. Russell also had brief stints as a sportscaster, businessman, and as a professional writer with books, Second Wind and Russell’s Rules, published in 1979 and 2001. In 2007 Russell was awarded an honorary doctorate from Suffolk University. He received a similar degree from Harvard University two weeks later. On February 14, 2009, NBA Commissioner David Stern announced that the NBA Finals Most Valuable Player Award would be renamed the Bill Russell NBA Finals Most Valuable Player Award. In 2011 President Barack Obama presented Russell the Presidential Medal of Freedom. Bill Russell currently lives on Mercer Island near Seattle, Washington. Bill Russell and Taylor Branch, Second Wind (New York: Ballantine Books, 1979); Bill Russell and Alan Steinberg, Red and Me: My Coach, My Lifelong Friend (New York: Harper, 2009); Zander Hollander, The Modern Encyclopedia of Basketball (New York: Dolphin Books, 1979); http://www.nba.com/history/players/russell_bio.html.